There is just too much wrong. Ferguson to Afghanistan, my neighborhood to yours. So much anger, shame, sadness… can’t sort it out. 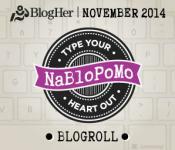 This entry was posted in Other and tagged NaBloPoMo 2014 by Assembling a Cooking Life. Bookmark the permalink.